This chapter investigates a specific case of Baconian experimentation, that is, a series of controlled experimental trials Bacon undertook in order to study the processes of maturation and putrefaction. The results of these trials were repeatedly used by Francis Bacon in his writings to illustrate the motions of spirits enclosed in matter. In this chapter, I reconstruct some of Bacon’s experiments with apples placed under different circumstances and conditions, as recorded in Historia vitae et mortis, De vijs mortis, Novum organum and Sylva Sylvarum. 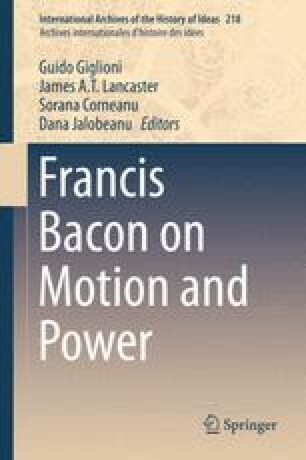 I argue that they help reassess several problematic aspects concerning Bacon’s attitude towards the experimental knowledge of nature. Firstly, they offer a paradigmatic situation in which one can explore Bacon’s creative and critical handling of sources. Secondly, they show Bacon at work as an experimenter who carefully and accurately observed, recorded and imagined interesting experimental set-ups and variations of experimental parameters, while displaying an interest in experimental methodology and the limits of experimental procedure. Finally, Bacon’s apples are a good way of exemplifying the multiple uses and functions experiments play in his natural and experimental histories. Research for this chapter has been carried out with the support of the ERC Starting Grant 241125 MOM. My thanks to Guido Giglioni and James A.T. Lancaster for their useful suggestions and comments on this chapter.